It’s still zucchini season in our part of the world, but cooler weather is strolling in. So we’re starting to enjoy richer dishes – like this one. It’s an all-time favorite of ours. We particularly like to share this pasta dish with friends. Few can resist its creamy, cheesy goodness. So don’t be surprised if your guests ask for the recipe. You have our permission to share it with them. 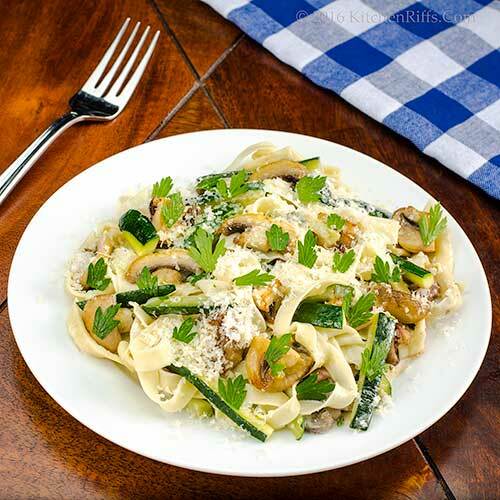 This dish is essentially Fettuccine Alfredo with the addition of zucchini, mushrooms, and prosciutto. You can make this recipe with dried pasta, but we think it tastes particularly succulent with fresh pasta. You’ll need to use about one batch of our Homemade Pasta or about a pound of store-bought fresh or dried pasta (exact quantity not critical). We found this recipe years ago in the late (and much lamented) Gourmet magazine. It dates from the late 1970s or early 1980s. The inclusion of prosciutto is our idea; leave it out if the idea doesn’t appeal to you. You can serve this dish as either a starter or a main (we usually opt to use it as the main course). This dish takes about 10 to 15 minutes to make (assuming you have fresh pasta on hand, or are using dried pasta). This recipe serves 4 as a main course (you’ll probably even have a bit left over) or twice that number as a first course. Leftovers keep for a day or two if refrigerated in an airtight container. Everything comes together quickly with this recipe, so be sure to prep all the ingredients before you begin making the sauce (Step 9). You may need to adjust the timing a bit, especially if you’re using dried pasta (see Notes). Place a big cooking pot of water (at least 4 quarts) on the stovetop to heat. Then prep the ingredients while the water is coming to a boil. Wipe off the mushrooms with a damp paper towel. Slice the mushrooms thinly, then set them aside. Wash and dry the zucchini. Cut it into julienne slices. Set aside. Chop the prosciutto (if using) into slices of about ¼ inch. Set aside. Grate the Parmigiano-Reggiano cheese. Set aside. Wash and dry the parsley, then mince it. Set aside. Divide the butter into ½ stick and 1 stick portions. Cut the butter into small pieces. Measure out the cream. Set both aside. The water is probably boiling by now. Turn the stovetop heat down to low (so the water stays hot, but isn’t boiling). Place a large frying pan (the 12-inch size is ideal) or Dutch oven over medium stovetop heat. When hot, add the ½ stick butter and let it melt. Add the mushrooms and prosciutto (if using), then sauté for 2 minutes. Add the julienned zucchini, the heavy cream, and the remaining stick of butter. Add salt and black pepper to taste. Bring the mixture to a simmer and cook for 3 minutes. While the zucchini mixture is cooking, bring the pasta water back to a boil. Add 1 tablespoon of kosher salt to season the water, then add the pasta. If using fresh pasta, cook for 2 minutes or until al dente (see Notes if using dried pasta). Drain the pasta, then add it to the zucchini mixture. Add the ¾ cup of grated Parmigiano-Reggiano cheese and the parsley. Toss together and adjust the seasoning. Serve with additional grated Parmigiano-Reggiano and a sprinkling of minced parsley for garnish, if desired. As noted above, you may need to be a bit flexible with timing. If the zucchini mixture (Step 10) finishes cooking before the pasta is ready, just set it aside for a minute. Then reheat it when you add the pasta (Step 12). Dried pasta takes longer to cook than fresh pasta. So if using dried, you might want to add it to the cooking pot (along with seasoning salt) as soon as the water starts boiling (Step 8). Then delay beginning the sauce (Step 9) for a couple of minutes to give the pasta time to cook. We recommend using 1 pound of pasta, but you can get away with ¾ pound if you want a sauce-heavy dish. If using dried pasta, we suggest using a shape that the sauce will cling to. Farfalle (butterflies) would be our choice. You can substitute Pecorino Romano cheese for Parmigiano-Reggiano if you wish (though its flavor is a bit stronger). BTW, feel free to increase the quantity of cheese – it’s hard to add too much to this dish. We use kosher salt for cooking (sea salt at table). Kosher salt is less salty by volume than regular table salt (its large crystals don’t pack as densely). If using regular table salt, use about half as much as we suggest. But always adjust salt and black pepper to your own taste. It looks so comfy and delicious. Love Alfredo sauce and prosciutto added to this pasta dish! I would come for seconds. This pasta dish looks so good , my hubby had something similar last night when we ate out for dinner. It's the rich flavors that make a dish like this so delicious. I can't tell you how much I miss Gourmet. Ruth Reichl, who was the editor of Gourmet, has a blog that I follow and I love reading her books. Hi Denise, it's easy -- too easy! -- to eat seconds of this. Ask me how I know. :-) Thanks for the comment. Hi Gerlinde, really too bad that magazine is gone. Anyway, this dish lives on! And it's a really good one. :-) Thanks for the comment. Hi Pat, really nice dish, isn't it? SO tasty! Thanks for the comment. Four servings -- 1 1/2 sticks of butter -- 1 cup of cream -- that's a really retro quantity of delicious dairy fat! Worthy of early Julia Child, or as you say, the old and unreconstructed Gourmet. I want it now! I love comforting pasta dishes like this, we still have lots of zucchini too. Thanks John! 10-15 minutes sounds like a perfect dinner recipe! And this looks light for an alfredo dish too. With only 15 minutes needed to prepare this dish, I could make it once a week. I love everything you added to the pasta. It must have a nice rich flavor and be very satisfying. And it's pretty too! Have a lovely weekend! Hi Evelyne, glad you got the violet liqueur! And this is a great dish -- one of our faves. :-) Thanks for the comment. Hi Mae, yup, this is rich. Great for a blowout dinner, though. Then we can all blow up. :-) Thanks for the comment. Hi Cheri, pasta dishes are the best, aren't they? Never tire of them! Thanks for the comment. Hi Pamela, this is SO quick to whip up! And SO tasty. :-) Thanks for the comment. Hi Tricia, this is pretty, isn't it? And tastes wonderful! Thanks for the comment. Hi GiGi, bummer that you can't eat pasta -- it is so nice! :-) Thanks for the comment. Now this is how to enjoy all that late summer zucchini! Love that is recipe is quick to come together and also worthy of a dinner splurge! Bravo! Alfredo is a favourite of my kids and although I enjoy it, I don't like the no vegetable thing. I usually sneak in broccoli but I like this idea! 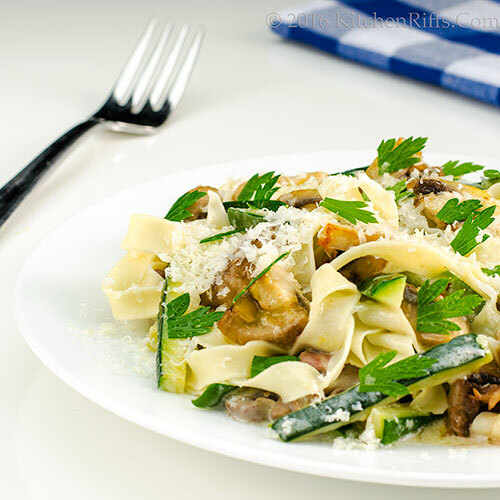 I love mushrooms with pasta and zucchini too. This is a great late summer/early fall dish. Thanks, John! Hi Fran, yup, I was thinking of Smith's book -- love that line. I actual read it on a trip to NYC a couple of years ago -- made a point of seeing some of the places she & Maplethorpe hung out (and there's a great donut shop in the Chelsea Hotel building!). Thanks for the comment. Hi Deb, it's a wonderful dish -- and very rich So definitely a splurge! Thanks for the comment. Hi Nazneen, this is a great way to eat your veggies. And cream. And butter. :-) Thanks for the comment. Hi Liz, yup -- easy does it. :-) Thanks for the comment. I love pasta dishes as this one. And it is another great way to use some of zucchini that is still in my garden. Hi Liz, definitely health food! :D And really wonderfully tasty. Thanks for the comment. Hi Dawn, we could probably eat pasta every night and not get tired of it. And this is one of our favorites -- so good! Thanks for the comment. Hi Bobbi, mushrooms always punch above their weight, don't they? SO much flavor, and they shine in this dish! Hope your basil plant recovers! Thanks for the comment. looks yummy. pictures make it all the more tempting. Hi Summer, it is! :-) Thanks for the comment. Hi Smitha, it's really good -- one of our favorites. :-) Thanks for the comment. My daughter LOVES pasta and she has been trying to make more dishes by herself - prepping for when she goes off to college next year and I know she will love to make this AND eat it! Thanks so much for sharing - such a good recipe to use up all that summer zucchini! Yes! I've been missing pasta and this could be the solution. Fun fact: my friend recently pointed out that I could glorify instant ramen by adding vegetables (I have no idea why I never thought of that...) and it's totally true. 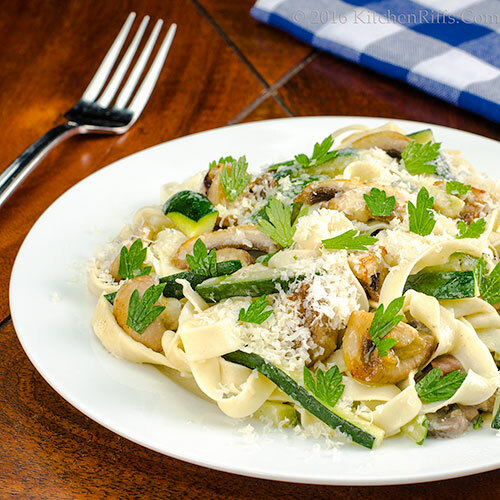 I've been avoiding fettucine alfredo lately because it's usually too plain--but these additions are great! (Much better than instant ramen, too.) Will have to try soon. Hi Shashi, your daughter will love this! And the leftover reheat in a microwave pretty well. Or they're also good cold -- ask me how I know! :-) Thanks for the comment. Hi Ala, you'll love this -- plus it's an easy way to get your veggies. :-) Thanks for the comment. This is such a great weeknight meal! I just happen to have mushrooms in the fridge so this dish is on! My stomach is rumbling right now! Love simple pastas like this and using fresh ingredients. I'm not growing zucchini, but I think yellow squash would work here. What do you think? The addition of prosciutto and all that butter (YUM!) makes this extra special! Thanks for a great pasta idea for my summer squash. Hi Pamela, this is a good one! And the leftovers will make a good lunch tomorrow. :-) Thanks for the comment. Hi MJ, simple, but rich. But that's OK now and again. :-) Haven't used yellow squash but I can't see why it wouldn't work. The flavor should be lovely! Thanks for the comment. Nice pasta dish John...and yes, I love the idea of zucchini, prosciutto and mushroom in Alfredo "like" pasta dish...thanks! Hi Juliana, really fun ingredients, don't you think? Good stuff! Thanks for the comment. Hi Karen, this is such a good dish! Of course with all that butter and cream it better be! :-) Thanks for the comment. Any pasta that has cheese and prosciutto is one for me. No wonder this one is such a favorite of yours. Hi Carolyn, hard to resist cheese and prosciutto, isn't it? And this really is a wonderful dish. Don't have it as much as we used to because it's so rich, but sometimes you just have to have it. :-) Thanks for the comment. Hi Greg, I know those overgrown zucchini all too well! You'll love a double batch of this. :-) Thanks for the comment. Hi Barb, love to have you for dinner! :-) And yes, this is decadent. Sometimes you just have to do it, right? Thanks for the comment. Hi Anu, isn't this a nice nice? Wonderful flavor! Thanks for the comment. All my favorite ingredients in one single dish. WOW! Just can't wait to try this out. delicious! Hi Kushi, you'll love this! SO much flavor. :-) Thanks for the comment. Hi Amira, isn't this a neat dish? SO good! You'll love it. :-) Thanks for the comment. Something about Alfredo sauce is such comfort food for me. Never would have thought to pair it with a zucchini dish. Brilliant! Hi Ashley, the Alfredo sauce really works well with zucchini and mushrooms -- really special combo. :-) Thanks for the comment. Love the sound of this for a veggie mid-week meal. I always have mushrooms and courgettes hanging around! Hi Carolyn, this is so quick to put together -- it'd make a perfect weekday dinner! Thanks for the comment. What a wonderful dish John! 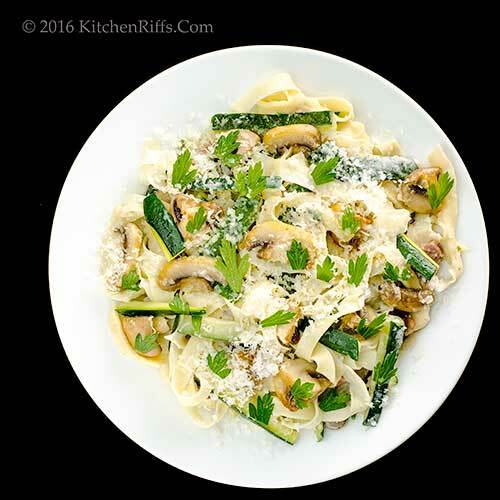 I love fettuccine alfredo and my wife enjoys mushroom and zucchini a lot so I am definitely seeing serving this dish very soon! Thanks for the inspiration! I think this dish looks delicious! I like to make alfredo with zucchini and alfredo with mushrooms, but I haven't put the two together before. Hi Yi, you'll love this! It's a good one. :-) Thanks for the comment. Hi Amy, the combo of the zucchini and mushrooms really is quite good -- bet you'll really like this! Thanks for the comment. Hi Raymund,heaven on a plate is a good way to describe this dish! :-) Thanks for the comment. I love how you'e jazzed up this classic dish. But yours looks much more interesting! Hi Chris, this is definitely good stuff! :-) Thanks for the comment. Hi Eva, looking at food blogs always makes me hungry too! And it doesn't matter when I last ate. :-) Thanks for the comment. Fresh pasta and alfredo sauce is my all-time favorite meal. Love these vegetables in the dish too! I want to come for dinner! Hi Lisa, we love pasta with alfredo sauce too! Such good stuff, isn't it? And this really take it up a notch. :-) Thanks for the comment. Hi Bobbi, :-) Sorry about the basil plant, but really looking forward to all those recipes! I agree with Liz -- the veggies make it healthy. Nice twist on the classic, as usual, John. I kid you not. Hi Rosemary, important to make healthy dishes. :-) And this one certainly is. Or at least that's what we tell ourselves! Thanks for the comment. I like the combination of ingredients in this dish. I also like that you kept it sauce-light, which, I think, seems really right for fresh pasta. Hi Jeff, this is such a nice dish! We used to serve this all the time, but then I'll bet we went a good 10 years without making it. Back in our rotation now. :-) Thanks for the comment. Lovely recipe, John! Creamy and cheesy are always a temptation for me. We still have some zucchini lurking so thank you for sharing. And I'm glad you're making this dish again after so long! Hi Hannah, I can't believe we got out of the habit of making this! It's SO good! :-) Thanks for the comment.